PORTLAND, OR - (May 14, 2018) - Today, De La Salle North Catholic High School (DLSNC) is inviting community members to help in the search for a new school building. DLSNC has called the building at 7528 North Fenwick Avenue home for the last 11 years. 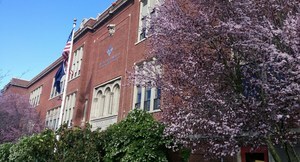 Formerly Kenton Elementary School, the building, built in 1913, is owned by Portland Public Schools. DLSNC’s current $440,000 annual lease is set to expire in June 2021. There is no option to extend the lease or purchase the property. Opened in 2001, De La Salle North Catholic High School provides a faith-based, college-preparatory high school education to students from the Portland area who would not otherwise have access to a reliable college-preparatory education. De La Salle North Catholic is sponsored by the Christian Brothers and is a part of the Roman Catholic Archdiocese of Portland/Western Oregon. Rigorous academics coupled with exposure to real-world work opportunities are the reasons that on average 98 percent of De La Salle North Catholic High School’s graduating seniors earn acceptance to college. Most recently, 100 percent of the 51 students in the class of 2017 were accepted to college and were awarded $3.8 million in scholarship funding. Students at DLSNC attend class four days per week and work for a local company one day each week as part of the Corporate Work Study Program (CWSP). The CWSP provides work experience, business contacts and helps offset the cost to educate students. De La Salle North was the first school to replicate the innovative Corporate Work Study Program pioneered by Cristo Rey Jesuit High School in Chicago. There are now more than 30 schools throughout urban America that model their school after the Cristo Rey model. The school was founded to provide this unique educational opportunity to families who would not be able to afford a private, college-preparatory education. A nationwide, independent rating agency identified DLSNC as the most diverse private high school in all of Oregon. The student body is 42 percent Latino/Latinx, 31 percent black, 15 percent Caucasian, 8 percent multiracial, 3 percent Asian, and 1 percent Pacific Islander. DLSNC’s black students are African-American, Ethiopian, Congolese, Haitian and Tongan. Its Hispanic students are American and immigrants from Mexico, Guatemala, Honduras, Nicaragua and Peru. The diversity goes beyond skin color and country of origin; it extends into students’ religious identification as well. DLSNC is a Catholic school, yet its students identify as 41 percent Christian (non-Catholic), 39 percent Catholic and 20 percent other faith. The school also has Jewish members of staff and Muslim students. “Our goal is to develop tomorrow’s community leaders by making high-quality education accessible to motivated young people in a learning environment that values cultural, spiritual and ethnic diversity,” O’Mara said. On average, students enter the school about one-and-a-half grade levels below benchmark. This means they are learning five-and-a-half grade years of curriculum in four school years while being in the classroom only 80 percent of the time because of the CWSP, and they are gaining college acceptance after graduation. DLSNC has been looking for a new location for two years. A committee of community supporters, which includes leaders from Shiels Obletz Johnsen, Inc., BORA Architects, Walsh Construction, Gerding Edlen and Guardian Real Estate Services, continues to engage in the search and explore future locations. The team is concentrating its efforts on finding a 55,000-square-foot building or a former school in the Portland area that could be retrofitted. It needs to be located in a place with access to public transportation because its students have a work-study job to get to every week. “Our vision for the future is to secure a permanent location to transform the educational experience of the students we serve. A home of our own will give our students and staff a sense of pride, strengthen our community, and inspire past, current and future students of De La Salle to build fulfilling lives that advance the common good,” added O’Mara. Opened in 2001, De La Salle North Catholic High School provides a faith-based, college-preparatory high school education to students from the Portland area who would not otherwise have access to a reliable college-preparatory education. Students at De La Salle North Catholic High School attend class four days per week and work for a local company one day each week as part of the Corporate Work Study Program (CWSP). The CWSP provides work experience, business contacts and helps offset the cost to educate students. A nationwide, independent rating agency has identified De La Salle North Catholic High School as the most diverse private high school in all of Oregon. De La Salle North Catholic is sponsored by the Christian Brothers and is a part of the Roman Catholic Archdiocese of Portland/Western Oregon.